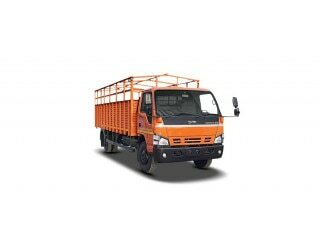 Feb 13, 2019: The SML Isuzu Samrat GS is built on a wheelbase of 4,750 mm. It has a GVW (Gross Vehicle Weight) of 10,250 kilograms. The vehicle comes with a box boy and a day cabin is featured on the chassis. Inside the cabin, there is a power steering having tiltable column, which enhances the convenience of the driver. There is also a driver information display and an adjustable driver seat. The truck comes with SLT4 inline, common rail, direct-injection diesel engine, which is paired with a 5-speed manual gearbox and is assisted by a single plate diaphragm clutch. The engine delivers a good amount of power and torque. It has air brakes that take care of the braking duties. These are efficient enough to stop the truck in most scenarios.